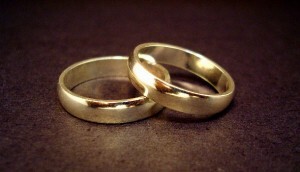 As I prepare to marry a young couple, I contemplate again God’s reasons for marriage. Marriage is for companionship. It is also for the procreation of children. But largely forgotten is its role in our salvation. Here’s a 50th-wedding anniversary sermon I preached from the archives on that topic. You have an oriental rug, old, elegant, rich with color and detail. Lines and designs weave their way into the fabric of the rug. But you lose your mind one day, and slash the carpet into many pieces, thinking you can make many beautiful carpets from the one. Colored fibers scatter into the air. And the design of what was meant to be has been brought to ruin. What do you have? A mockery, a useless collection of ragged fragments, each grieving because of what it once was, and what it could have been. Instead of one beautiful carpet, you have chaos. Desi and Joyce, God has called you to live your lives as one, amid a world of chaos, not letting the world turn you into a tattered remnant and fragment. You are called to be one in marriage like the Church is to be one in Christ. For you are not two, but one flesh. God has called you to live in love, each to serve the other as Christ serves you. This has been your calling for the last 50 years–and who knows how many more, but God! Our lives today are often coming apart at the seams–but God still calls you to be one. And today you even celebrate your 50 years of blessed unity. What is the Source of this unity? Christ; He is the end-all and be-all of your unity. He is the Founder and Finisher of your faith, even the fullness of what your faith is meant to be. Christ starts, keeps, and finishes–through the Spirit He has sent–the faith He has given you, the faith in you, the faith lived through you. As Christ continues to shape and form your marriage, it lives out–although imperfectly–the self-sacrifice of Jesus Christ. The infinite God contained Himself in the finite of human flesh. He took on flesh and blood, and Jesus became man and dwelt among us, all so He could sacrifice Himself to save you in both body and soul. Self-sacrificial love conforms to the commandment to love your neighbor as yourself. And your first neighbor God has given you to serve is the other: Desi to Joyce, and Joyce to Desi. And so each of you have served the other for these past 50 years. I’m sure these years have been good and bad, tear filled and joyous, as you strove forward in the faith, hand in hand. No doubt, dark hours and times of sorrow have filled your lives. But in the depths of the night, you have continued to believe in the Son and the Light, you have continued to trust in Christ as your Savior from sin, death, and hell. And through it all, your love for each other has deepened. God says, “It is not good for the man to be alone,” and so He created a companion at Adam’s side. And so God teaches us that marriage is for companionship. God told Adam and Eve to be fruitful and multiply. And so God teaches us that marriage is to have children, where more may be raised in the nurture of the Lord and brought into His kingdom. But marriage is also for your salvation. As you struggle through life, it’s easy to wander off God’s narrow way, to let the flashing lights of this world distract you, and lose your faith. And so it is as Scripture says, “Better two than one alone, for their partnership yields a good reward” (Ecclesiastes 4:9). What better way to serve than each to keep calling the other back to the faith, each to be the face of Christ to the other, each urging the other to receive Him in the gifts of Word and Sacrament. Marriage is a journey through sorrows and joys, as your last 50 years have shown you. When the sorrows seem overwhelming, remember that God is with you, even in the person of your spouse. For that’s how God works His will in our lives–through others. Joyce, Desi will help you bear your crosses; Desi, Joyce will help you bear your crosses. Recognize the Christ in each other, that you don’t have to bear the weight of this world alone. For Jesus is with us always, as He has promised. But He is not with us only in a distant and far-reaching way. Jesus comes to us in the preached Word and the Sacraments, especially the Lord’s Supper, where He gives us Himself in His body and blood. But He is also with you in each other. For isn’t Jesus in each of you, each of you into whom the Holy Spirit has breathed the breath of faith, the breath of life? And what does Jesus do? He saves. He saved you 2,000 years ago when He became sin, so that you might become the righteousness of God. He continues to save you now, keeping you in the one true faith as He comes to you in Word and Sacrament. And He will save you on the Last Day, when He calls you into His kingdom and says, “Well done, my good and faithful servant” (Matthew 25:21). Desi and Joyce, God has brought you together, so that each may love and serve the other. And this loving and serving courses on, even into eternity. Speak the Word of Christ, the One who is the Word, to each other. His Word will not return empty, but will do what He has sent it to do. Each of you is to bring Christ to the other. Each of you is to serve according to where God has placed you to serve. Desi, Joyce, your calling is to keep each other strong in the faith, where Christ will continue to come and save you, yes, even each through the other. Never lose sight of the purpose of your life together: it isn’t just for companionship, it’s also for the salvation of your souls. God loves you so much that He has given you someone to call you back in the faith, when you are tempted to wander away. Yes, friendship, the marriage bed, companionship, all these are wonderful, important, and blessed by God. But nothing, nothing, is more precious than your salvation. That’s why God brought you together 50 years ago. It wasn’t just young love; it was for the salvation of your souls. That’s how much God loves you. Amen.